Parasol Lunch Pail Hummingbird Feeder, Tall, Blue, 17.5 oz. Ensure that your hummingbirds have enough to eat throughout the day with the Parasol Lunch Pail Hummingbird Feeder. Reminiscent of old fashioned lunch pails, this tall feeder has five individual feeding ports in a vertical line. Each station has its own perch for the comfort of your hummingbirds. The deep blue vessels contrast your surrounding foliage and offset the black metal frame. The bright red feeding flowers mimic trumpet vine and draw hummingbirds to the feeder. Each hexagonal reservoir is crafted from hand blown glass, and retains some of the style of its artist. The vessels each hold 3.5 ounces of nectar, keeping it fresh and healthy. Use the included 2.25" metal "S" hook to hang this piece in your garden. 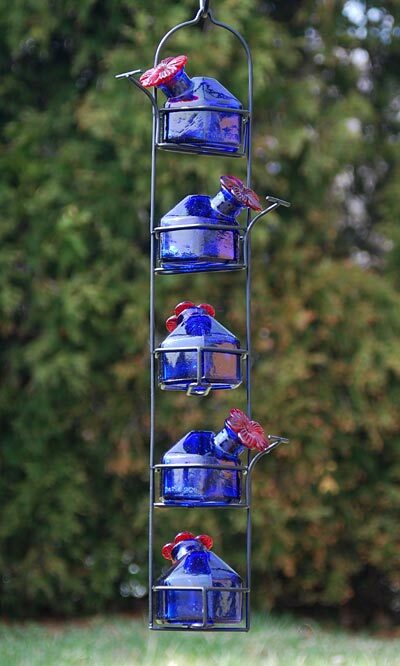 Invite the "flying jewels" to dine in your yard anytime with the Lunch Pail Hummingbird Feeder with Blue Vessels. Parasol Lunch Pail Hummingbird Feeder, Tall, Aqua, 17.5 oz. Parasol Lunch Pail Hummingbird Feeder, Tall, Green, 17.5 oz. Parasol Bloom Hummingbird Feeder, Blue, 16 oz. Parasol Filigree Hummingbird Feeder, Ocean, 20 oz. Parasol Filigree Hummingbird Feeder, Sprinkles, 20 oz.